When we met a Gaumentkitzel for sketch night I’d already had dinner so just ordered a decaf and sketched Susan’s dinner instead. I added gouache when I got home. Carole Baker is an amazing painter in remote northern Alaska who I’ve known through our blogs and correspondence for years. 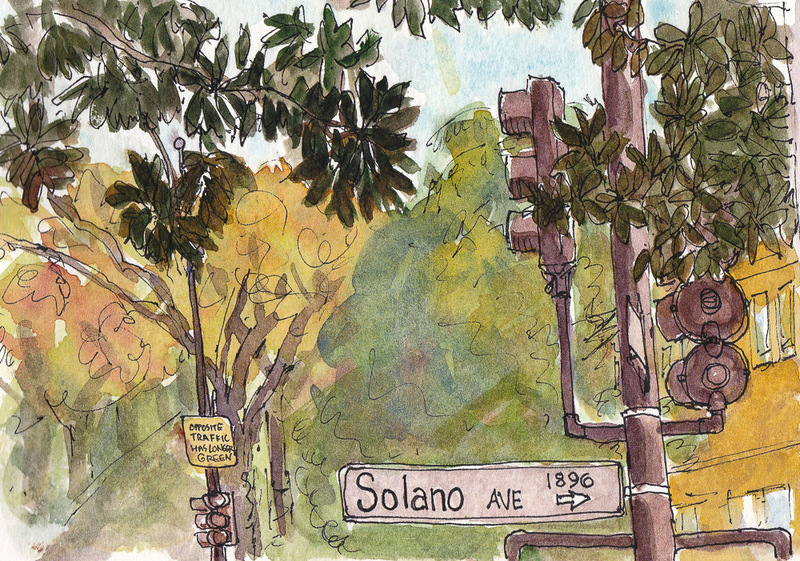 When she was in Berkeley for a visit we met in North Berkeley to sketch. 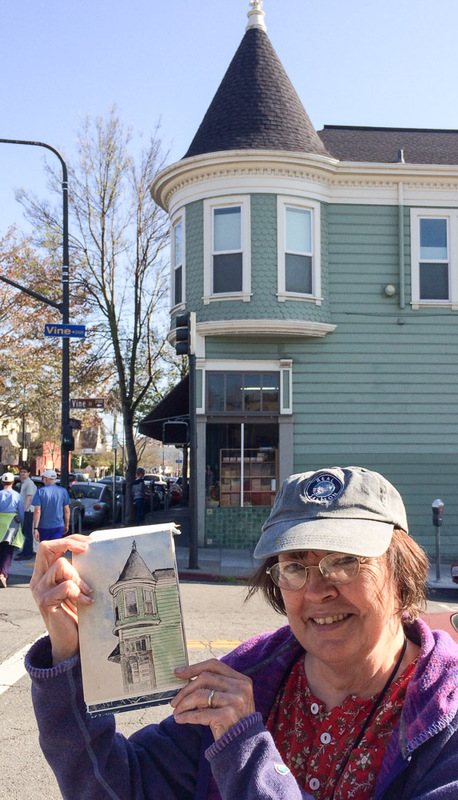 Above is a photo of my wonky sketch (held by Carole so that I could photograph it) of Earthly Goods, the store on one corner of Vine and Shattuck. We sat on the same bench but looked in opposite directions. 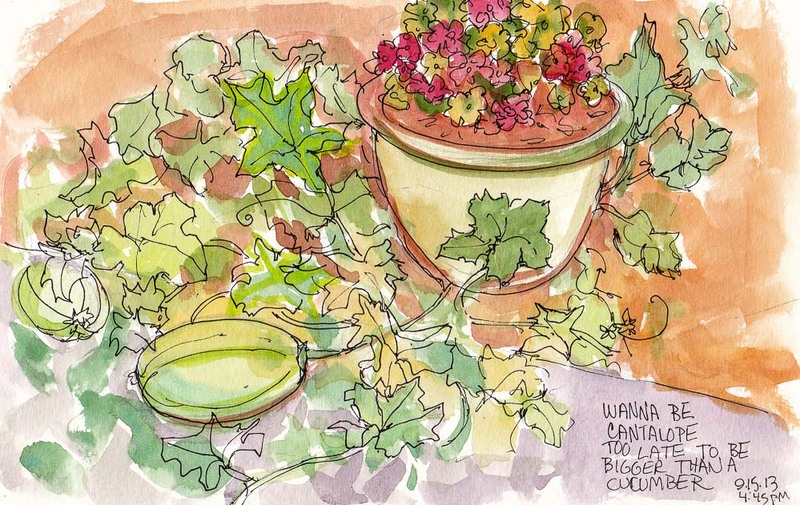 Here is Carole and her sketch of the produce market on the opposite corner of Shattuck and Vine. I was so inspired by Carole and her art on the beautiful greeting cards she gave me as a gift. You can see Carole’s art on her blog Carole Baker’s Art Journal. Sounds like a great title for a children’s book, no? 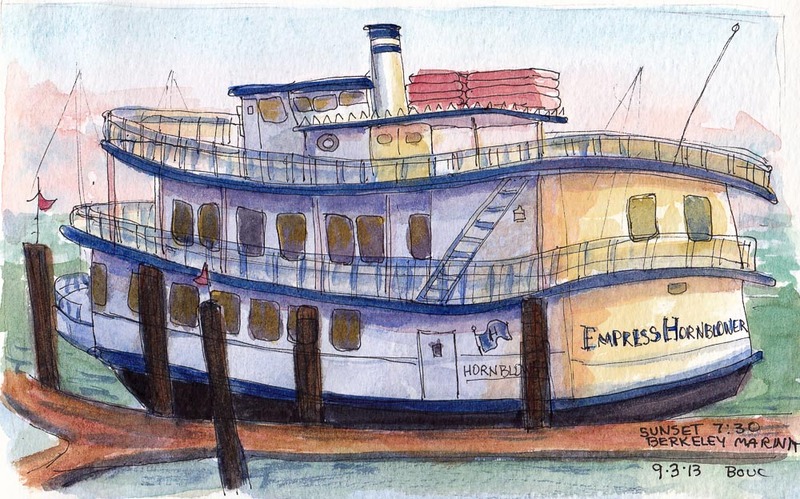 The Empress Hornblower (above) is part of a fleet of party boats moored behind the ritzy hotel at the northern Berkeley marina, an area long-time residents remember as the old Berkeley dump. Before “ecology” and “global warming” were common words, cities dumped their garbage, old cars, construction rubble, etc. in the San Francisco Bay. As they filled in the bay with garbage, they created new land on which they built housing, freeways, and, when they finally closed the dump, parks and hotels. My tenant (I own/live in a duplex) loves to garden so I put in a raised bed for her and we prepared the soil along the side of our property for flowers and veges. When she planted cantaloupes I warned her they wouldn’t thrive in our foggy climate but she ignored me. They were cute but never got bigger than chubby cucumbers, and probably most of that was skin. She pulled them out before she left on vacation in October. I didn’t have the heart to ask her if she ate them or put them in the green bin for recycling. Although cold autumn weather and even snow already arrived in much of the western hemisphere, always radical Berkeley begs to differ. We had an unusually unfoggy and warm summer, a toasty fall, and now, with temperatures in the 70s we’re back to summer again. So far 2013 is the driest year in Bay Area history with less rain than any year in recorded history, all the way back to the Gold Rush. After a delay posting work from the summer due to various health issues, at least it doesn’t feel awkward to be posting them now, thanks to our seemingly endless summer. 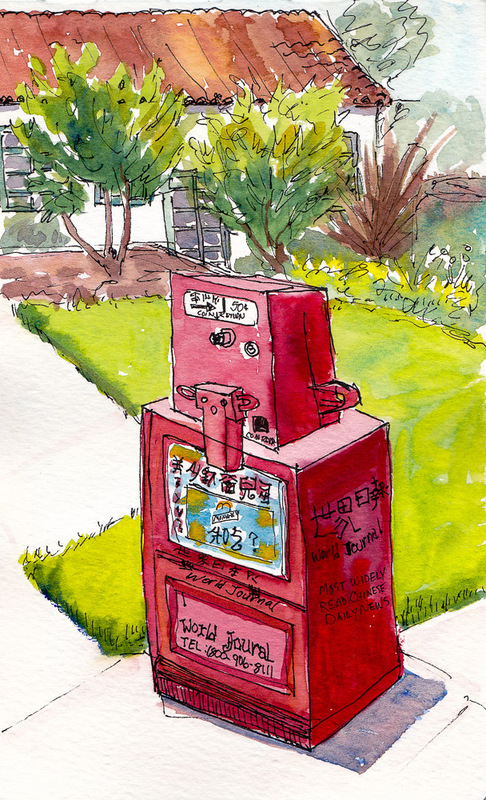 In the sketch above, this bright red Chinese newspaper box on the Clark Kerr Campus immediately drew my attention. Clark Kerr was built in the 1930s as a residential school for the blind. When blind students began mainstreaming into regular public schools, the University of California Berkeley bought the complex for student housing. 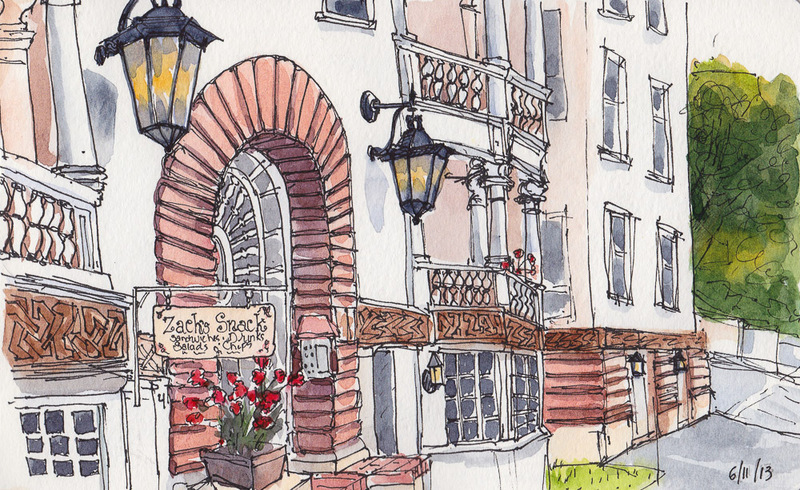 Clark Kerr’s beautiful, serene grounds and Spanish style buildings provide an oasis of sketching opportunities in the middle of a busy urban area. The Elmwood Theater was originally named The Strand and was built in 1914 in an Art Nouveau architectural style. Admission was ten cents for adults and five cents for kids. It closed in 1941 and reopened as the Elmwood in 1947 with a new “zigzag Moderne” decor. All the zigzags and neon made for a fun drawing challenge. I sat on my stool on College Avenue, sheltered from the wind in the doorway of a shop closed for the evening, while people went in and out of the Korean restaurant next door carrying their fragrant food to go. Halfway through the drawing a man climbed up a ladder and started changing the movie titles. I considered including him in the sketch but couldn’t figure out a way to make it work. By the time I finished drawing it was time to meet up so I added color at home. My favorite part of the sketch is the pigeons. Berkeley’s Euclid Avenue ends at the north side of University of California’s Berkeley campus (the greenery on the right, above). This block has everything you’d expect for a street abutting a college: shops with pizza, beer, coffee, burgers, snacks, and oh yeah, books. There is some great architecture in this neighborhood too, including this apartment building with a snack shop tucked away in a little basement room. I’ve probably walked past here a hundred times and never noticed the interesting features of this building, with porches, pillars, carved wood decorations, fancy brickwork, and cool old lanterns. Only when I stopped to draw and started really looking did I see what was there all along. When Cathy said, “Let’s sketch at the top of Solano Avenue Tuesday night” I chose to literally sketch the top of Solano: looking up and drawing the tops of streetlights, buildings and trees. It’s common here to refer to the “top” and “bottom” of streets when they’re on a hill, and 2-mile long Solano is on a slight incline as it runs from the start of the Berkeley Hills at The Alameda (just a street, but for some reason called “The Alameda”), down almost to the bay. I sat at a table outside a café and sketched the view at sunset. There are so many beautiful trees in Berkeley!